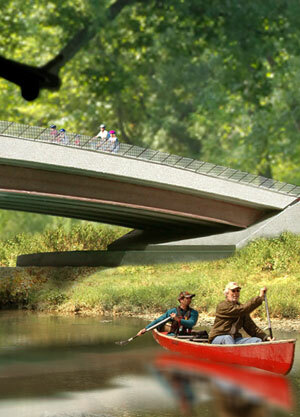 An ambitious project is taking shape in Louisville, Kentucky, a city of nearly three-quarters of a million. The Parklands of Floyds Fork, which won an ASLA planning and analysis award, will help expand Frederick Law Olmsted’s original vision for the community. Olmsted had created a series of parks and parkways just outside the edge the late 19th century city, in an effort to “bring nature to the neighborhoods.” Now that Louisville, a city with more than 100 parks totaling 12,000 acres, has been engulfed by development, the city is turning eastward to seek new green horizons. 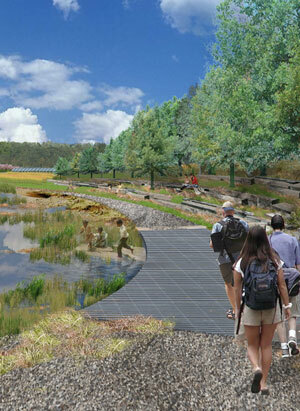 WRT, a Philadelphia-based landscape architecture firm, is working with their client, 21st Century Parks, a local non-profit, to develop a plan that adds some 4,000 acres of open space to a 20-mile length of bottomland in eastern Jefferson County. The firm says this $113 million project will create a green infrastructure framework to shape the expected future growth of the community and help the city create a more sustainable model for urban growth beyond the city limits. The Parklands will be divided into four new parks, each with their own purpose and character. Beckley Creek Park, Pope Lick Park, Turkey Run Park and Broad Run Park will be linked by a braided system of passages, including a water trail on the creek (Floyds Fork), a park road, local roads, and a multipurpose trail corridor called the Louisville Loop. 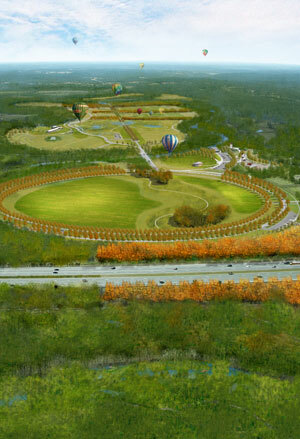 The Parklands will form one fifth of 100-mile length of the Louisville Loop, first proposed in WRT’s mid-1990’s plan for the regional open space network. Beckeley Creek Park will offer the grand open space, a 23-acre “Egg Lawn,” with canoe launches into the ponds, along with lodges and picnic areas. Visitors can fish in those ponds, use the sports fields, or bring their kids to a “creekside playground and spray park.” Intriguingly, WRT is also building a “bark park.” Turkey Run Park will have “adventure programming” like zip lines and rope courses, along with rock climbing, while Broad Run Park will provide access to the waterfalls, springs, and wetlands. 2,000 acres of forestland will increase oxygenation and store CO2. 400 acres will be converted to support sustainable agriculture; no chemical use allowed. All that protected habitat will provide home to 25 species of reptiles and amphibians; 40 species of fish; 20 species of freshwater mussels; 138 species of birds; 19 mammals; and 450 types of native plants, including endangered ones. The team is also looking to improve the standard subdivision model used in Louisville by creating a “model” community development in an “ailing, partially developed, adjacent subdivision” purchased by the group when real estate prices were low. These new model subdivisions are expected to be dense, offer high levels of connectivity, leverage the green infrastructure systems, and protect the natural habitat. It’s good to see the project’s managers are starting to think out how to combine the benefits of both nature and density. As a number of landscape architects have argued, if you want people to live in dense urban areas, you need nature. The first phase will be completed in 2013, with following phases finished by 2015. Explore the parkland and see the earlier master plan. What a wonderful details on this project! You really go into depth — I had no idea Louisville was doing this. It’s pretty inspiring! My brother lives in Seattle and they have this amazing bike trail/green strip that runs from the northern suburbs into downtown. This reminds me a bit of that – with the addition of preservation of natural ecosystems, of course!